Basing so much of our government support on an increasingly complicated and largely avoidable, or at least deferrable, income tax has promoted crass consumerism, destroyed motivation to save and invest, sparked significant privacy invasion, and created an expensive industry focused on avoiding those taxes. All wealthy people and wise middle class people do whatever they can to avoid taxable income, and resulting strategies and efforts often lead to significant inefficiencies in the economy, people with investable money making decisions based on tax policy rather than on business issues. 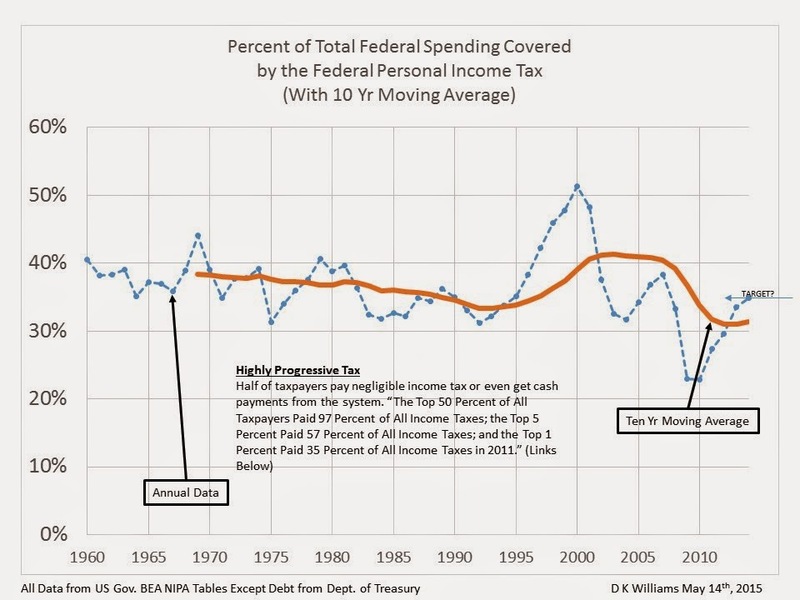 And, the percent of federal spending funded by the monster income tax code continues to dwindle, not because tax collections are down but because they have not kept up with increases in spending. Warren Buffett for example has wealth of about $50B and, during tax discussions in 2011, revealed that he had reported taxable income of $62M on which he paid income tax of $6.9M. The $62M is about 0.12% of his wealth which is proof enough that his investments are structured to minimize income. And the effective tax rate of a little over 10% paid on that $62M proves that he gave away a lot of the trivial, to him, income and had other tax deductions which made the marginal tax rate of 36% to 39% or so a meaningless number. Mr. Buffett famously argued that his rate was lower than that of his secretary, once Payroll Taxes were included, and that therefore income tax rates should be increased. Mr. Buffett, of course, pays no Payroll Tax. Rate increases would have no significant effect on his own tax bill but would punish middle income tax payers not in a position to focus on tax avoidance strategies. I am an admirer of Mr. Buffett’s business acumen and his modest lifestyle but was disappointed in this nonsensical position he took. So, go ahead and jack up the top marginal rates if that seems like a reasonable solution to our fiscal irresponsibility. It won’t make any difference except to create jobs for lots of tax advisors as they devise ways for their clients to avoid taxable income. And almost nobody except a few middle class folks with families and good jobs will see higher tax bills. A still progressive income tax with no exemptions, exclusions, deductions, or credits at lower rates that most people would willingly pay would however make a real difference. This schedule which I suggested in 2011 would have cost Buffett $18.5M rather than $6.9M. Jacking up the marginal rates on the system we have would cost him nothing. The other side of the coin is that, if we totaled up the total tax bills for local, state, and federal taxes of all the businesses in which Mr. Buffett has a controlling interest and of all their employees, I expect we would be quite impressed by the contribution they make to the economic well-being of the USA, and our focus on tax policy should be to facilitate development of such businesses. We now have a clear majority and possibly almost 100% agreement, among interested parties, that the current Income Tax code is ridiculous for a variety of reasons. Solutions proposed range from simply establishing higher brackets for the irrational grouping of millionaires, billionaires, corporate jet owners, and people making more than $250,000 a year to completely abolishing the Income and Payroll Taxes and replacing them with the Fair Tax, which is a flat tax on consumption or, in simpler terms, a BIG sales tax. Establishing higher brackets for millionaires and billionaires is fine, but it won’t make much difference to them or to our national financial situation. I object to it unless done as a part of comprehensive reform because, once done, everybody will sit back and wait to see the dollars rolling in and the deficit shrinking, only to be disappointed. And time will have been lost. Attacking the corporate jet business will simply destroy employment and taxable incomes in that small but important segment of the economy much as was done with the Bush I special luxury excise tax on yachts twenty years ago. Jacking up marginal rates on folks earning $250,000 a year will simply punish those who are already bearing the major portion of the tax burden and are the big spenders in the economy. At the other extreme, the Fair Tax is an intriguing idea and would have been a much better choice than the income tax when the income tax was first implemented. Under the fair tax, we would never have become a consumer driven economy with all the environmental and energy problems that go along with that. We would have remained a frugal people, focused on savings and investment, and would have no national debt. But, the Fair Tax is a long shot and would be a very difficult transition to make. Probably nobody would buy anything but necessities for a couple of years, and the economy would really hit bottom. Still, I am glad that smart and talented people are championing the Fair Tax, hope their efforts pull us in that direction away from the ridiculous, and won’t be upset if, by some miracle, they are successful. The Flat Tax, a simple across the board flat rate on all income with no or almost no exemptions, deductions, exclusions, or credits has a lot of appeal. I strongly favor the simplification and like the idea that an income tax should tax all income, but I’m not so conservative as to believe that it is unreasonable for a person to pay a higher marginal tax on their second million dollars of income than on their first or even on their second hundred thousand than on their first. Under this scenario, Warren Buffett would have paid ~$18,500,000 in taxes on his $62,000,000 in taxable income instead of the $6.9M he claimed in the interview with Charlie Rose. Is that enough? Well, I’m sure it will satisfy some and fail to satisfy others and Buffett won’t even notice the difference. It would definitely be a much higher effective rate than his office staff would pay. The questions are whether the federal government can put that extra $12M to better use than Buffett and whether Buffett would still have voluntarily given away $30,000,000 without that charitable tax deduction?